Community - General Pencil Co., Inc.
We have many talented artists working with us. Find out more about them. Please visit our Art Gallery to see our products in use. Scroll through the many art projects submitted by artists created with General Pencil product. If you want to show your art made with General's®, submit here! New to fine art? Don't know how to use that Kimberly® Watercolor pencil? A seasoned art educator looking for new ideas? 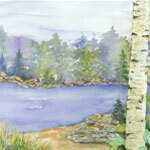 Artist Kathi Hanson provides fun art projects , tips, techniques and MUCH more in this area, "Kathi's Korner". Check back often for new downloads, ideas and step-by-step projects!